Kate Middleton has an idea about how to turn Prince William into Prince Hairy. During a visit to the prestigious Sydney Royal Easter Show on Good Friday, April 18, the Duke and Duchess of Cambridge were shown a tuft of alpaca wool — which Duchess Catherine jokingly suggested her husband ought to use as a toupee. The royal couple were walking around Sydney Olympic Park in Australia when they came across exhibitor Lyn Crejan, a farmer from the settlement of Glenn Innes in New South Wales. Crejan, 67, showed them the wool at the Duke&apos;s request; it just happened to be the same shade of brown as his hair. "The Prince was interested in the alpaca, and as I showed it to them, the Princess said he should put it on his head," Crejan said of Prince George&apos;s parents. "She said, &apos;You need it more than me,&apos; and pointed to his head and he laughed." First held in 1823, the 14-day Royal Easter Show attracts more than 900,000 visitors every year and features prize-winning livestock and more than 10,000 items of produce on display. There are also interactive exhibits on pig patting and cow milking, among other things. 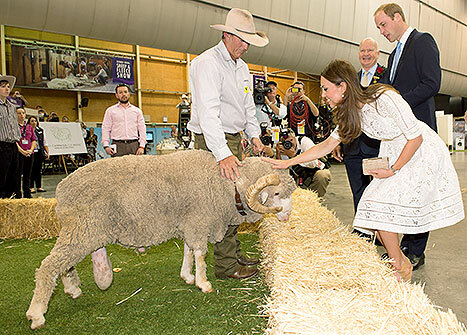 During their tour of the arena, the Duke and Duchess witnessed a sheep-shearing display and met Fred, a 6-year-old merino ram. Fred gave them a formal greeting, lowering himself down to one knee (with the help of his owner, sheep farmer Jim Murray). "He&apos;s very intelligent, sheep are highly trainable if they&apos;re treated right," Murray said. 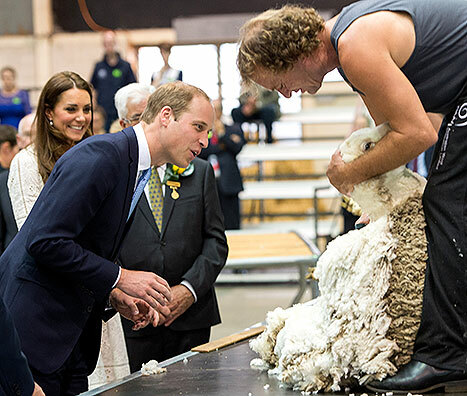 "The Duke and Duchess were very impressed with his size and stature and how soft his wool was." The couple also took time to chat with other visitors, including Sarah Xabreyas, 8, who gifted the Duchess with a bracelet. "She was lovely, everything I thought a princess to be," Sarah said of Middleton, 32, who wore a white lace Zimmerman dress and tan wedge sandals. "She actually put my bracelet on before she walked to the car."